This paper discusses the Data Mover, an abstraction for expressing machine-independent customized communication algorithms arising in block-structured computations. The Data Mover achieves performance that is competitive with hand-coding in MPI, but enables application-specific optimization to be expressed using intuitive geometric set operations that encapsulate low-level details. NAS, NASA Ames Research Center: The NAS Parallel Benchmarks. http://www.nas.nasa.gov/Software/NPB/ (1997). Donaldson, S., Hill, J., and Skillicorn, D.: BSP Clusters: High-Performance, Reliable and Very Low Cost. 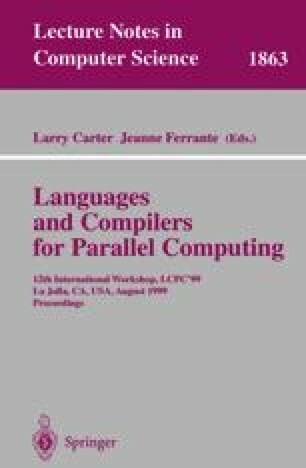 Oxford University Computing Laboratory Technical Report PRG-5-98, http://www.cs.queensu.ca/home/skill/papers.html (1998).